Q1. The binary number 10101 is equivalent to decimal number …………..
Q4. 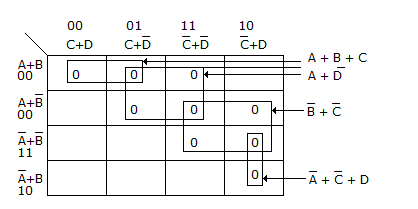 The inputs of a NAND gate are connected together. The resulting circuit is …………. Q8. The only function of NOT gate is to ……………..
Q10. In Boolean algebra, the bar sign (-) indicates ………………..
Q11. The resolution of an n bit DAC with a maximum input of 5 V is 5 mV. The value of n is ……. Q12. 2’s complement of binary number 0101 is ……….. Explanation: 1’s complement of 0101 is 1010 and 2’s complement is 1010+1 = 1011. Q13. An OR gate has 4 inputs. One input is high and the other three are low. The output is ……. Explanation: In OR any input high means high output. Explanation: 1010 = 8 + 2 = 10 in decimal. Q15. Both OR and AND gates can have only two inputs. Explanation: Any number of inputs are possible. Q16. A device which converts BCD to seven segments is called …….. Explanation: Decoder converts binary/BCD to alphanumeric. A = 11100101. Therefore Ā = 00011010 and A’ = Ā + 1 = 00011011 = 16 + 8 + 2 + 1 = 27. Therefore A = -27. Q18. A decade counter skips ……….. Explanation: A decade counter counts from 0 to 9. It has 4 flip-flops. The states skipped are 10 to 15 or 1010 to 1111. Q19. BCD input 1000 is fed to a 7 segment display through a BCD to 7 segment decoder/driver. The segments which will lit up are …………. Explanation: 1000 equals decimal 8 Therefore all segments will lit up. Q20. A ring counter with 5 flip flops will have ………. states. Q21. For the gate in the given figure the output will be ……….. Explanation: If A = 0, Y = 1 and A = 1, Y = 0 Therefore Y = Ā.
Q23. The circuit in the given figure is a ………… gate. Explanation: Since V(1) is lower state than V(0) it is a negative logic circuit. Since diodes are in parallel, it is an OR gate. Q24. Which of the following is non-saturating? Explanation: The octal system has 8 digits 0 to 7. Explanation: Access time = 0.95 x 10 + 0.05 x 100. Q27. The expression Y = pM (0, 1, 3, 4) is ………….. Explanation: This is a product of sums expression. Q28. An 8 bit DAC has a full scale output of 2 mA and full scale error of ± 0.5%. If input is 10000000 the range of outputs is …………. Q29. Decimal 43 in hexadecimal and BCD number system is respectively……. and …….. Explanation: All AND inputs must be 1 and inhibit 0 for output to be 1. Q32. The greatest negative number which can be stored is 8 bit computer using 2’s complement arithmetic is …….. Explanation: The largest negative number is 1000 0000 = -128. Q33. A JK flip flop has tpd= 12 ns. The largest modulus of a ripple counter using these flip flops and operating at 10 MHz is ……..
Q34. The basic storage element in a digital system is …………. Explanation: Storing can be done only in memory and flip-flop is a memory element. Explanation: In a ripple counter the effect ripples through the counter. Q36. A 12 bit ADC is used to convert analog voltage of 0 to 10 V into digital. The resolution is ………. Q37. 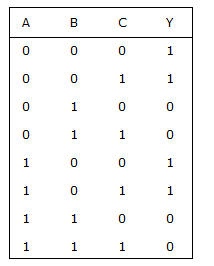 For the truth table of the given figure Y = …………. Q40. The output of a half adder is ………. Q41. Minimum number of 2-input NAND gates required to implement the function F = (x + y) (Z + W) is ………..
Q42. Which device has one input and many outputs? Explanation: Demultiplexer takes data from one line and directs it to any of its N output depending on the status of its select lines. Explanation: In look ahead carry adder the carry is directly derived from the gates when original inputs are being added. Hence the addition is fast. This process requires more gates and is costly. Q44. The counter in the given figure is …………. Explanation: When counter is 110 the counter resets. Hence mod 6. Q45. In register index addressing mode the effective address is given by ……..
4 = 22, in up scaling digit will be shifted by two bit in right direction. 7BF16 = 7 x 162 + 11 x 161 + 15 x 160 = 1983 in decimal = 0111 1011 1111 in binary. Q47. For the minterm designation Y = ∑ m (1, 3, 5, 7) the complete expression is …………..
Q48. Zero suppression is not used in actual practice. Explanation: Zero suppression is commonly used. Q49. A counter type A/D converter contains a 4 bit binary ladder and a counter driven by a 2 MHz clock. Then conversion time is ………..
Q51. The number of distinct Boolean expression of 4 variables is ……. Q53. A memory system of size 16 k bytes is to be designed using memory chips which have 12 address lines and 4 data lines each. The number of such chips required to design the memory system is ………. Q54. In a 7 segment display, LEDs b and c lit up. The decimal number displayed is ………. Q55. 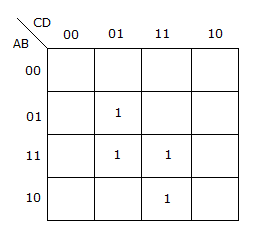 In a BCD to 7 segment decoder the minimum and maximum number of outputs active at any time is …. Minimum number of outputs when input is decimal 1 and maximum number of outputs when input is decimal 8. Q56. A three state switch has three outputs. These are …….. , …….. , ………. Q57. Maxterm designation for A + B + C is ………. Q58. 1’s complement of 11100110 is ………………. Explanation: By replacing 1 by 0 and 0 by 1.